There has been relatively little change during the past four decades in the way dermatopathologists approach and interpret biopsies obtained from inflammatory skin disorders. If anything, there has been a stronger emphasis on clinicopathologic correlation as an aid to arrive at a clinically meaningful diagnosis. Nevertheless, new and novel observations made under the microscope have improved our understanding of several existing conditions and paved the way toward recognition of newer entities. This review looks at a selection of inflammatory dermatoses which are either newly recognized or where unique microscopic findings published in recent years have refined our understanding of some established conditions. Since the publication of the first English text on cutaneous disease in 1714, De morbis cutaneis by Daniel Turner, there has been an almost exponential increase in the number of dermatological entities. This discovery into the breadth of cutaneous disease was facilitated by advances in dermatopathology. The process of clinicopathologic correlation and the need for histology as a foundation for dermatological diagnosis were advanced by Unna in 1894. With the advancement of dermatopathology and with the advent of the genomic era, this process of identifying new entities and improvement in the understanding of existing conditions continues unabated. This article aims to highlight recent advances in select inflammatory conditions ranging from newly described entities, novel observations in established diseases to refinement of diagnostic features and disease classification. The entities highlighted within this article are organized according to the traditional pattern-based approach championed by Ackerman et al. For utility, these disorders are discussed in descending order of localization of the histopathologic changes, starting from the epidermis, dermis to those which primarily affect the subcutis. Dermatitis artefacta (DA) is a psychocutaneous disorder, whereby patients self-inflict cutaneous lesions to satisfy unmet psychological needs. Importantly, the patient denies any responsibility for the lesions, and to the clinician, there are no rational benefits to the self-mutilation. The mechanisms of injury are diverse including excoriation, blunt trauma, thermal burns, application of caustic substances, and foreign body injection. Understandably, given the range of mechanisms employed, the lesional morphology is equally diverse and ranges from bullae to purpura to ulceration. A constant feature is that lesions are localized in sites accessible to the patient. They tend to be more frequent on the nondominant side and depending on the etiology may assume symmetrical, angulated, or geographical outlines. Biopsies are usually performed with the suspicion of DA already formulated to exclude other diagnoses that may account for the clinical appearance. The histological findings include sharply delineated areas of ulceration or vesiculation, “mummified” pattern of epidermal necrosis frequently associated with sparing of the adnexa, lack of significant dermal inflammation, and localized areas of dermal hemorrhage. In 2013, Winters et al. added epidermal multinucleated keratinocytes to the histopathologic spectrum of DA. During the following years, Gutierrez et al., Amin et al., and Sweeney et al. independently reported additional cases establishing the link between multinucleated epidermal keratinocytes and DA.,, The multinucleated keratinocytes are present at various levels of the epidermis and may contain up to 20 nuclei. The nuclei vary from large and vesicular with prominent nucleoli to small, pyknotic, and mummified in appearance [Figure 1]a,[Figure 1]b,[Figure 1]c.,, Awareness of this phenomenon is particularly important in the setting of blistering lesions of DA, where they may be confused with epidermal keratinocytes infected by herpesvirus. In contrast to those in herpesvirus infection, the multinucleated keratinocytes in DA have a larger number of nuclei which lack nuclear molding or margination of chromatin. It has been postulated that damaged, dyskeratotic tonofilaments may interfere with the mitotic apparatus preventing cell division and thereby leading to multinucleation. Grover disease is a common pruritic papulovesicular pruritic eruption of unknown etiology that was first described in 1970 by Grover. It predominantly affects the sun-damaged skin of the trunk and proximal extremities in middle-aged or elderly Caucasian men. Despite the synonym “transient acantholytic dyskeratosis,” persistent pruritic and chronic asymptomatic forms of Grover disease are also known to occur. The histopathologic hallmark of Grover disease is acantholysis accompanied by a superficial perivascular lymphocytic infiltrate, often with admixed eosinophils. Four distinct histopathologic patterns are commonly recognized: Darier-like, pemphigus vulgaris-like, Hailey–Hailey-like, and spongiotic. Commonly, these patterns coexist which serve as a useful diagnostic clue. It was not until 2010 that the histopathologic variation of Grover disease was critically reappraised by Fernández-Figueras et al. 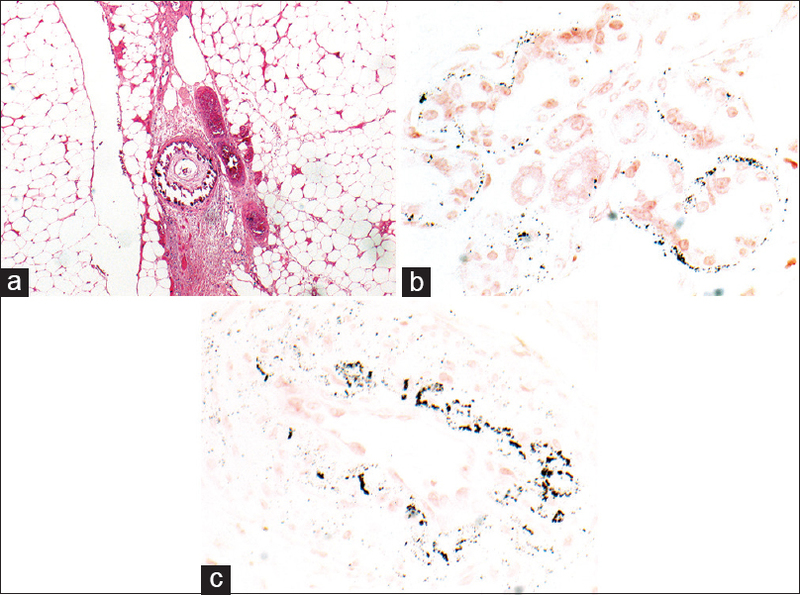 This group reviewed 120 archival cases of Grover disease (having at least one of the conventional patterns) and identified five additional histologic patterns: porokeratotic, lentiginous, vesicular, lichenoid, and dysmaturative. In the porokeratotic form, there are cornoid lamellae with associated hypogranulosis and basal vacuolization [Figure 2]a. Lentiginous Grover disease is characterized by elongated rete ridges with basal hyperpigmentation and acantholysis affecting the stratum basalis or superficial layers of the epidermis [Figure 2]b. In the vesicular variant, there is intraepidermal vesiculation with acantholysis [Figure 2]c. The lichenoid pattern is characterized by mild lymphocytic inflammation at the dermoepidermal junction with subtle acantholysis. The dysmaturative form features disordered keratinocyte maturation with nuclear pleomorphism and mild hyperchromasia in addition to acantholysis. In 2013, Wiersma et al. alluded to a pseudoherpetic variant where the acantholytic cells may be potentially mistaken for herpesvirus-infected epidermal cells because of keratinocyte multinucleation and dyskeratosis [Figure 2]d. Unlike herpesvirus infection, acantholytic cells in Grover disease are generally localized to the suprabasal epidermis and lack nuclear molding. This broadening of the histopathologic spectrum significantly expands the scenarios in which Grover disease needs to be considered in the differential diagnosis. It should be pointed out that irrespective of these newly described variants, acantholysis and the presence of a dermal lymphocytic infiltrate usually accompanied by eosinophils remain the bedrock for histopathologic diagnosis of Grover disease. The existence and nosologic position of eosinophilic annular erythema (EAE) has been steeped in controversy. It was first described in 1999 by Kahofer et al., who were struck by a morphologically gyrate erythematous rash histologically characterized by an eosinophil-rich perivascular lymphocytic infiltrate [Figure 3]a and [Figure 3]b. Since the original description of EAE, there has been considerable debate surrounding its relationship with eosinophilic cellulitis (Wells syndrome). Like eosinophilic cellulitis, EAE shows a marked angiocentric eosinophil-rich infiltrate, but flame figures and granulomatous inflammation were conspicuously lacking. Clinically, it usually does not show prodromal symptoms or edema, lacks a relapsing and remitting course, and neither does it result in morphea-like areas upon resolution. Subsequent authors have sometimes considered EAE as a variant of eosinophilic cellulitis. Rongioletti et al. described two patients with clinicopathologic features consistent with the original description of EAE but with the addition of flame figures and surrounding granulomatous inflammation. They postulated that EAE was a clinical subset of eosinophilic cellulitis presenting with an annular or figurate pattern. In 2013, El-Khalawany et al. reported a prospective multicenter study of 10 patients diagnosed with EAE, the largest case series published to date. Biopsies performed at varying stages of lesional evolution showed a spectrum of histopathologic changes. They found that early, minimally edematous, plaques contained a dense dermal eosinophilic infiltrate, some of which had degranulated and were accompanied by a small quantity of lymphocytes and histiocytes. Well-developed figurate or annular lesions in comparison exhibited a mixed infiltrate of histiocytes and eosinophils. There was papillary dermal edema in the majority of cases. Flame figures with surrounding multinucleated giant cells were easily identified in long-standing cases. They observed that aggressive immunosuppression even in combination regimens had little clinical impact and suggested that EAE was a particularly chronic and treatment-resistant variant of eosinophilic cellulitis. In defining the autoinflammatory phenotype, McDermott et al. considered cutaneous inflammation as a prominent feature which waxes and wanes with fluctuating disease activity, often resolving completely between flares. In recent years, attempts have been made to group MAD based on easily identifiable clinical criteria that can be elicited from a patient's history, physical examination, fever patterns, skin lesions, and associated clinical findings. The following six clinical groups have been proposed: (1) nonspecific maculopapular rash/classic “periodic fever syndromes,” for example, FMF and TRAPS; (2) neutrophilic urticaria/cryopyrinopathies, for example, Muckle–Wells syndrome; (3) granulomatous skin lesions and minimal or low-grade fever attacks, for example, Blau syndrome/early-onset sarcoidosis; (4) pustular skin rashes and episodic fever, for example, deficiency of IL-1 receptor antagonist, Majeed syndrome, pyogenic arthritis, pyoderma gangrenosum, and acne syndrome; (5) atypical neutrophilic dermatosis with histiocytic-like infiltrate, for example, proteasome-associated autoinflammatory syndromes; and (6) syndromes with autoinflammation and immunodeficiency. Given the rarity, myriad of clinical presentation, and the requirement of extensive genetic testing to establish the diagnosis, it is not surprising that the histopathologic characteristics of individual MAD are yet to be elucidated in detail. A shared histopathologic feature which seems common to many MAD is the presence of perivascular and interstitial infiltrate comprising neutrophils [Figure 4] and/or lymphocytes [Figure 5]. Some interesting insights linking the pathogenetic mechanisms and histopathologic presentation have come to light in recent years. IL-1-mediated MAD often presents with neutrophilic urticaria, perivascular lymphocytic/monocytic infiltrate, and pustulosis. On the other hand, interferon-mediated disorders tend to feature vasculitis, livedo reticularis, and panniculitis. It must be pointed out that our understanding of MAD is still evolving. Awareness of these conditions among dermatopathologists is nevertheless very important for several reasons. It is hoped that in the near future, a clearer understanding of the microscopic features of individual MAD will assist in targeted genetic testing. Early diagnosis and prompt appropriate treatment is critical in preventing organ damage and life-threatening complications. From a therapeutic perspective, it is important to be aware that many of the MADs show an excellent response to IL-1-blocking agents. The neutrophilic infiltrate of Sweet syndrome is usually localized within the papillary and upper reticular dermis. Two recently described variants are worthy of mention, as they are characterized by an unusually deep extension of the inflammation. In the subcutaneous variant, the infiltrate is confined to the subcutaneous fat (usually as a lobular panniculitis) with sparing of the dermis. The latter often shows edema and reactive fibroblastic proliferation. The subcutaneous variant of Sweet needs to be histologically distinguished from other neutrophilic panniculitis, for example, early erythema nodosum, infectious panniculitis, panniculitic id reaction, and leukemia cutis. Distinction between subcutaneous Sweet syndrome and early erythema nodosum can be particularly vexing. It is useful to be aware that Miescher's radial granuloma, a useful clue for erythema nodosum, can also be seen in subcutaneous Sweet syndrome [Figure 6]a and [Figure 6]b. Since erythema nodosum tends to respond to nonsteroidal anti-inflammatory drugs (NSAID), it has been proposed that a trial of NSAID is an effective way of distinguishing the two entities in problematic cases. Kroshinsky and Fairley described an additional necrotizing variant of Sweet syndrome in immunosuppressed patients who presented with a rapidly expanding solitary erythematous plaque clinically mistaken for necrotizing fasciitis. The histopathologic features on the surgical debridement specimens closely mimicked necrotizing fasciitis, i.e., widespread acute necrotizing neutrophilic dermatosis involving the skin, subcutaneous fat, fascia, and skeletal muscle but persistently negative cultures and special stains for microorganisms [Figure 7]a and [Figure 7]b. A lack of improvement following surgery and antibiotic therapy, signs of pathergy at the sites of surgical intervention, and an excellent response to steroids are useful clues for necrotizing Sweet syndrome. Awareness of this unusual variant is critical for both dermatologists and plastic surgeons so that the vicious cycle of debridement and pathergic expansion of the process with significant morbidity can be avoided. The term “reactive granulomatous dermatitis” (RGD) has been recently coined by Rosenbach and English to encompass a complex group of interstitial granulomatous dermatitides (IGDs) which share overlapping clinicopathologic features and therapeutic options. The group includes IGD, palisaded and neutrophilic granulomatous dermatitis (PNGD), and interstitial granulomatous drug reaction (IGDR), conditions with substantial clinical, histopathologic, and therapeutic overlap. IGD (synonym IGD with arthritis) was first described in 1993 by Ackerman in patients presenting with a linear, cord-like configuration (“rope sign”) developing in the setting of inflammatory arthritis. Other triggers include hematological malignancies and medications. Although linear cord-like lesions are virtually pathognomonic, the clinical spectrum of IGD has been expanded to include erythematous macules, skin colored or erythematous papules, plaques, and nodules, predominantly involving the extremities of middle-aged females. Histologically, there is an interstitial infiltrate of histiocytes, centered in the deeper dermis often surrounding degenerate collagen fibers [Figure 8]a and [Figure 8]b. Mucin deposition is scant to absent. Given the overlapping clinical and histopathologic features, similarities in disease associations, and treatment strategies, it makes conceptual sense to use the unifying term RGD and simply identifying the underlying trigger rather than trying to fit them rigidly under IGD, PNGD, or IGDR. Postirradiation morphea (PIM) is a rare complication of radiation therapy which is increasingly being encountered in breast cancers patients treated with radiation therapy. First described in 1989 by Colver et al., less than 100 cases have been reported although the incidence appears to be rising due to the increasing emphasis on a breast-sparing approach and postoperative radiation therapy for treatment of breast cancers. It is estimated that PIM affects 0.2% of breast cancer patients undergoing radiation therapy., The interval between radiation exposure and the development of PIM is highly variable and ranges from 1 month to 32 years. The clinical presentation is dependent of the stage of the disease and varies from erythematous and edematous plaques (early inflammatory) to induration, violaceous discoloration, and peau d'orange appearance of the affected area (advanced sclerotic). There is no clear relationship between the total radiotherapy dose, fractionation scheme, use of a boost, and the incidence of PIM. It is often clinically confused with locally recurrent carcinoma, radiation dermatitis, postirradiation atypical vascular proliferation, and cellulitis, prompting a skin biopsy. Unlike some of the other postirradiation dermatoses, PIM can sometimes extend beyond the area of prior irradiation. Indistinguishable histologically from conventional morphea, PIM progresses from an early inflammatory, intermediate to a late sclerotic stage. In the early inflammatory stage, there is an interstitial and perivascular lymphoplasmacytic with subtle collagen thickening [Figure 10]a. The intermediate stage features a lymphoplasmacytic infiltrate in the subcutaneous fat and around the eccrine gland coils along with thickening of the collagen bundles. In the late sclerotic stage, the reticular dermal collagen is swollen and hypocellular, inflammation is either sparse or absent, adnexal structures are lost, and there is replacement of the subcutaneous fat by sclerotic collagen [Figure 10]b. A skin biopsy plays a vital role in distinguishing PIM from several other postirradiation disorders which may appear clinically similar. This includes acute radiation dermatitis (keratinocyte apoptosis, vasodilation with fibrin thrombi, and erythrocyte extravasation), subacute radiation dermatitis (interface dermatitis with satellite cell necrosis mimicking acute graft vs. host disease), and chronic radiation dermatitis (hyperkeratosis, acanthosis, and advanced sclerosis with bizarre “atypical” fibroblasts). Distinction of PIM and chronic radiation dermatitis can be problematic. PIM tends to show more inflammation, the fibrosis is centered in the dermis and the changes frequently extend beyond the radiation field. In comparison, chronic radiation dermatitis lacks inflammation and fibrotic changes primarily affect the subcutaneous fat and are limited to the radiation field. Awareness and prompt recognition of PIM is very important as a range of treatment options are available which can favorably modify the disease course and prevent disfiguring lesions, especially if instituted early. The clinicopathologic features of conventional and nonuremic calciphylaxis are identical and characterized by vascular calcification and cutaneous necrosis. Clinically, calciphylaxis presents with painful erythematous macules and plaques on adipose-rich areas which progress to retiform purpura and eventual necrosis and ulceration. There may be subtle subcutaneous induration extending beyond the visible surface lesions. Histopathologic features of calciphylaxis include small vessel mural calcification, intimal proliferation, and luminal thrombosis [Figure 11]a. Vascular calcification is not pathognomonic of calciphylaxis, and in particular, medium vessel calcification is common in patients with renal failure on hemodialysis. A number of other histopathologic features which may serve as useful clues in the appropriate clinical context include dermal ulceration, dermal-epidermal separation, dermal angiomatosis, lobular panniculitis, and fat necrosis., A few relatively recent observations merit particular mention due to their usefulness in refining the histopathologic diagnosis of calciphylaxis. Subtle and stippled calcium deposits in the basement membrane surrounding eccrine coils (perieccrine calcification) and internal elastic lamina have been found to be useful in cases where vascular calcification is not obvious [Figure 11]b and [Figure 11]c. Pseudoxanthoma elasticum-like fragmentation and calcification of elastic fibers in the dermis have been noted in biopsies from calciphylaxis (including nonuremic form). The pathogenesis of calciphylaxis is poorly understood but is likely to be multifactorial involving dysregulation of calcium, phosphate, parathyroid hormone, and coagulation. In nonuremic cases, derangements in the function of receptor activator of NF-κ B ligand and osteoprotegerin are suspected to play a contributory role. The spectrum of known inflammatory skin disorders is constantly evolving. With ever closer clinicopathologic correlation, new entities and additional variants of established conditions are being revealed. While the advent of the genomic era is set to revolutionize tumor diagnosis, the ability of the dermatopathologist to engage with their clinical colleagues and maintain an up to date knowledge base remains key to accurate histopathologic interpretation and diagnosis in inflammatory skin diseases. 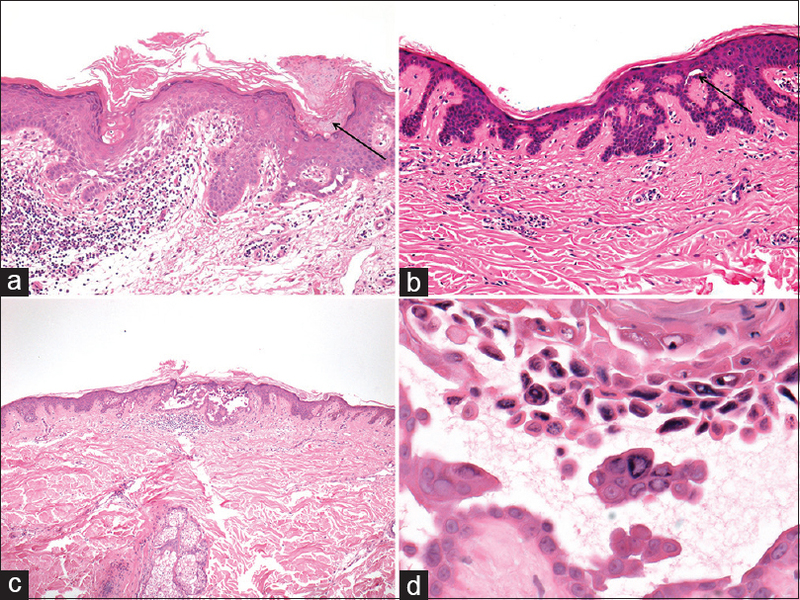 Ackerman AB, Chongchitnant N, Sanchez J. Histologic Diagnosis of Inflammatory Skin Diseases. Philadelphia: Lea and Febiger; 1978. Rodríguez Pichardo A, García Bravo B. Dermatitis artefacta: A review. Actas Dermosifiliogr 2013;104:854-66. Joe EK, Li VW, Magro CM, Arndt KA, Bowers KE. Diagnostic clues to dermatitis artefacta. Cutis 1999;63:209-14. Winters C, Machan M, Liu D, Fraga GR. Multinucleated giant cells in factitial dermatitis. J Cutan Pathol 2013;40:205-8. Gutierrez D, Schowalter MK, Piliang MP, Fernandez AP. Epidermal multinucleated keratinocytes: A histopathologic clue to dermatitis artefacta. J Cutan Pathol 2016;43:880-3. Amin SM, Yélamos O, Martinez-Escala ME, Shen L, Rosenbaum M, Gerami P, et al. Epidermal necrosis with multinucleated keratinocytes: A possible diagnostic clue for dermatitis artefacta in children. J Eur Acad Dermatol Venereol 2016;30:e101-2. Sweeney SA, Sulit DJ, Adams EG, Shvartsman KR, Rapini RP. Grape cells (Multinucleated keratinocytes) in noninfectious dermatoses: Case series and review of the literature. Am J Dermatopathol 2015;37:e143-6. Grover RW. Transient acantholytic dermatosis. Arch Dermatol 1970;101:426-34. Quirk CJ, Heenan PJ. Grover's disease: 34 years on. Australas J Dermatol 2004;45:83-6. Chalet M, Grover R, Ackerman AB. Transient acantholytic dermatosis: A reevaluation. Arch Dermatol 1977;113:431-5. Fernández-Figueras MT, Puig L, Cannata P, Cuatrecases M, Quer A, Ferrándiz C, et al. Grover disease: A reappraisal of histopathological diagnostic criteria in 120 cases. Am J Dermatopathol 2010;32:541-9. Wiersma GL, Saavedra AP, Yang FC, Nandi TR, Levine D, Murphy GF, et al. Pseudoherpetic grover disease: Report of 2 cases and review of the literature. Am J Dermatopathol 2014;36:746-50. Kahofer P, Grabmaier E, Aberer E. Treatment of eosinophilic annular erythema with chloroquine. Acta Derm Venereol 2000;80:70-1. Wood C, Miller AC, Jacobs A, Hart R, Nickoloff BJ. Eosinophilic infiltration with flame figures. A distinctive tissue reaction seen in wells' syndrome and other diseases. Am J Dermatopathol 1986;8:186-93. Rongioletti F, Fausti V, Kempf W, Rebora A, Parodi A. Eosinophilic annular erythema: An expression of the clinical and pathological polymorphism of wells syndrome. J Am Acad Dermatol 2011;65:e135-7. El-Khalawany M, Al-Mutairi N, Sultan M, Shaaban D. Eosinophilic annular erythema is a peculiar subtype in the spectrum of wells syndrome: A multicentre long-term follow-up study. J Eur Acad Dermatol Venereol 2013;27:973-9. Shwin KW, Lee CR, Goldbach-Mansky R. Dermatologic manifestations of monogenic autoinflammatory diseases. Dermatol Clin 2017;35:21-38. Galeazzi M, Gasbarrini G, Ghirardello A, Grandemange S, Hoffman HM, Manna R, et al. Autoinflammatory syndromes. Clin Exp Rheumatol 2006;24:S79-85. Bernot A, Clepet C, Dasilva C, Devaud C, Petit JL, Caloustian C, et al. A candidate gene for familial Mediterranean fever. Nat Genet 1997;17:25-31. McDermott MF, Aksentijevich I, Galon J, McDermott EM, Ogunkolade BW, Centola M, et al. Germline mutations in the extracellular domains of the 55 kDa TNF receptor, TNFR1, define a family of dominantly inherited autoinflammatory syndromes. Cell 1999;97:133-44. Almeida de Jesus A, Goldbach-Mansky R. Monogenic autoinflammatory diseases: concept and clinical manifestations. Clin Immunol 2013;147:155-74. Sweet RD. An acute febrile neutrophilic dermatosis. Br J Dermatol 1964;76:349-56. Cohen PR. Sweet's syndrome – A comprehensive review of an acute febrile neutrophilic dermatosis. Orphanet J Rare Dis 2007;2:34. Dinh H, Murugasu A, Gin D. Sweet's syndrome associated with cellulitis. Australas J Dermatol 2007;48:105-9. Su WP, Liu HN. Diagnostic criteria for Sweet's syndrome. Cutis 1986;37:167-74.
von den Driesch P. Sweet's syndrome (acute febrile neutrophilic dermatosis). J Am Acad Dermatol 1994;31:535-56. Requena L, Kutzner H, Palmedo G, Pascual M, Fernández-Herrera J, Fraga J, et al. Histiocytoid Sweet syndrome: A dermal infiltration of immature neutrophilic granulocytes. Arch Dermatol 2005;141:834-42. Vignon-Pennamen MD, Juillard C, Rybojad M, Wallach D, Daniel MT, Morel P, et al. Chronic recurrent lymphocytic Sweet syndrome as a predictive marker of myelodysplasia: A report of 9 cases. Arch Dermatol 2006;142:1170-6. Soon CW, Kirsch IR, Connolly AJ, Kwong BY, Kim J. Eosinophil-rich acute febrile neutrophilic dermatosis in a patient with enteropathy-associated T-cell lymphoma, type 1. Am J Dermatopathol 2016;38:704-8. Chan MP, Duncan LM, Nazarian RM. Subcutaneous sweet syndrome in the setting of myeloid disorders: A case series and review of the literature. J Am Acad Dermatol 2013;68:1006-15. Kroshinsky D, Alloo A, Rothschild B, Cummins J, Tan J, Montecino R, et al. Necrotizing Sweet syndrome: A new variant of neutrophilic dermatosis mimicking necrotizing fasciitis. J Am Acad Dermatol 2012;67:945-54. Rosenbach M, English JC 3rd. Reactive granulomatous dermatitis: A review of palisaded neutrophilic and granulomatous dermatitis, interstitial granulomatous dermatitis, interstitial granulomatous drug reaction, and a proposed reclassification. Dermatol Clin 2015;33:373-87. 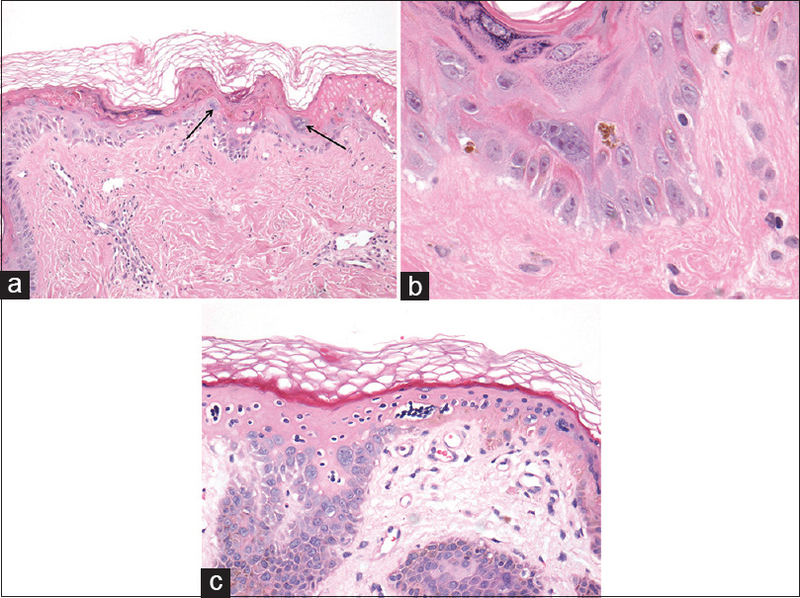 Ackerman AB, Guo Y, Vitale P. Clues to Diagnosis in Dermatopathology. Vol. 3. Chicago, IL: ASCP Press; 1993. p. 309-12. Peroni A, Colato C, Schena D, Gisondi P, Girolomoni G. Interstitial granulomatous dermatitis: A distinct entity with characteristic histological and clinical pattern. Br J Dermatol 2012;166:775-83. Chu P, Connolly MK, LeBoit PE. The histopathologic spectrum of palisaded neutrophilic and granulomatous dermatitis in patients with collagen vascular disease. Arch Dermatol 1994;130:1278-83. Sangueza OP, Caudell MD, Mengesha YM, Davis LS, Barnes CJ, Griffin JE, et al. Palisaded neutrophilic granulomatous dermatitis in rheumatoid arthritis. J Am Acad Dermatol 2002;47:251-7. Magro CM, Crowson AN, Schapiro BL. The interstitial granulomatous drug reaction: A distinctive clinical and pathological entity. J Cutan Pathol 1998;25:72-8. Colver GB, Rodger A, Mortimer PS, Savin JA, Neill SM, Hunter JA, et al. Post-irradiation morphoea. Br J Dermatol 1989;120:831-5. Spalek M, Jonska-Gmyrek J, Gałecki J. Radiation-induced morphea – A literature review. J Eur Acad Dermatol Venereol 2015;29:197-202. Schaffer JV, Carroll C, Dvoretsky I, Huether MJ, Girardi M. Postirradiation morphea of the breast presentation of two cases and review of the literature. Dermatology 2000;200:67-71. Morganroth PA, Dehoratius D, Curry H, Elenitsas R. Postirradiation morphea: A case report with a review of the literature and summary of the clinicopathologic differential diagnosis. Am J Dermatopathol 2013; DOI: 10.1097/DAD.0b013e3181cb3fdd. Bogdonoff MD, Engel FL, White JE, Woods AH. Hyperparathyroidism. Am J Med 1956;21:583-95. Nigwekar SU, Wolf M, Sterns RH, Hix JK. Calciphylaxis from nonuremic causes: A systematic review. Clin J Am Soc Nephrol 2008;3:1139-43. Kalajian AH, Malhotra PS, Callen JP, Parker LP. Calciphylaxis with normal renal and parathyroid function: Not as rare as previously believed. Arch Dermatol 2009;145:451-8. Kroshinsky D, Fairley DA. Calcifying and ossifying disorders of the skin. In: Bolognia J, Schaffer JV, Cerroni L, editors. Dermatology. 4th ed., Ch. 50. Philadelphia: Elsevier; 2018. Patterson JW, editor. Cutaneous deposits. Weedon's Skin Pathology. 4th ed., Ch. 7. London: Churchill Livingstone/Elsevier; 2015. Prinz Vavricka BM, Barry C, Victor T, Guitart J. Diffuse dermal angiomatosis associated with calciphylaxis. Am J Dermatopathol 2009;31:653-7. Mochel MC, Arakaki RY, Wang G, Kroshinsky D, Hoang MP. Cutaneous calciphylaxis: A retrospective histopathologic evaluation. Am J Dermatopathol 2013;35:582-6. Fernandez KH, Liu V, Swick BL. Nonuremic calciphylaxis associated with histologic changes of pseudoxanthoma elasticum. Am J Dermatopathol 2013;35:106-8. Reed KB, Davis MD. The incidence of physician-diagnosed calciphylaxis: A population-based study. J Am Acad Dermatol 2007;57:365-6.